One of the first places a prospective customer goes on a website is the “About Us” section. Not only can they read about the products or services, but they have the opportunity to meet the humans who will be providing them. The employees’ or leadership’s corporate head shots are a great way for a brand to show off who they really are, and make a strong first impression about their culture and personality. As a marketer, your job is to make sure you convey the right message about your brand in everything from your content to your site. The challenge in designing an effective “Meet the Team” page is communicating your brand while using memorable photos that highlight your team’s personalities and strengths. To show you what we mean, we’ve put together a list of three companies who nailed their brand’s style, while communicating the appropriate amount of personality… and three who failed to do so. Kickstarter adheres to its casual brand by showing off its employee’s charisma and character. The site shows candid, personal photos of the team, rather than professional, in-studio portraits. Each person is in their own world – some are at the beach, some are in costume, while others are artfully filtered or edited. Using diverse photos demonstrates the wide range of interests of the company’s employees, suggesting that a user’s unique funding project could easily succeed with this network. 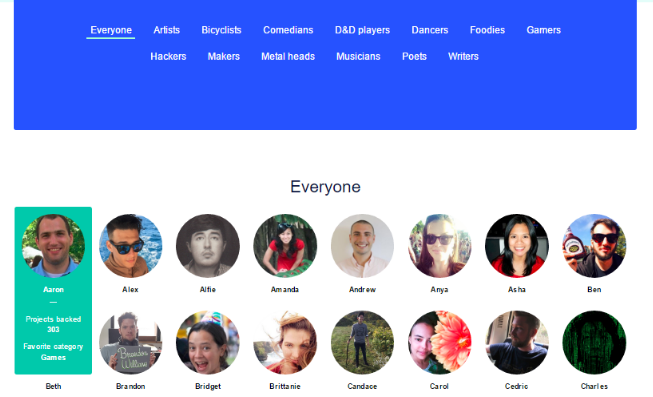 Kickstarter takes this a step further by demonstrating, and celebrating, the wide range of culture in the company by offering a refining sorting tool at the top to segment the personnel list by interests – “Artists,” “Bicyclists” and “Metal heads,” to name a few. The page then brings their wide range of personalities back to the brand’s message, and shows how tight-knit their community is and how excited they are about their service: Hovinger over each portrait shows how many Kickstarter projects each employee has backed. 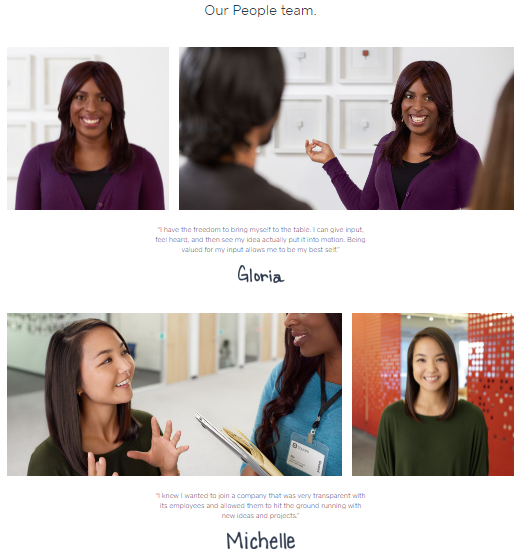 Wistia also nailed their corporate photos page, which the site refers to as a “Yearbook,” offers a collection of “Wistia Class Photos.” It also allows employees to say who they are, but in an even more minimal, visual way than Kickstarter’s. Wistia’s ultimate purpose is helping their clients convey a visual message as efficiently as possible, so they’ve applied the same idea to their corporate photos. Each employee has four frames to change their pose, modify their outfit or bring on a prop to express themselves, or just make you laugh. Mousing over each portrait makes it switch through the four shots like a flipbook. This inventive feature differentiates Wistia from many other sites, and the interactive photos help the company market their most valuable assets – their creative staff. It might seem easy to have fun with your corporate photos if your company is a young, technical, modern business in a developing new industry – online crowdsourcing and video hosting brands call for creativity like this. But what about brands in more traditional industries that have existed for decades, especially those that don’t immediately lend themselves to “zany” or “artsy” design? Apple has a simple mission and product: Their hardware and software enhance and simplify your daily life. 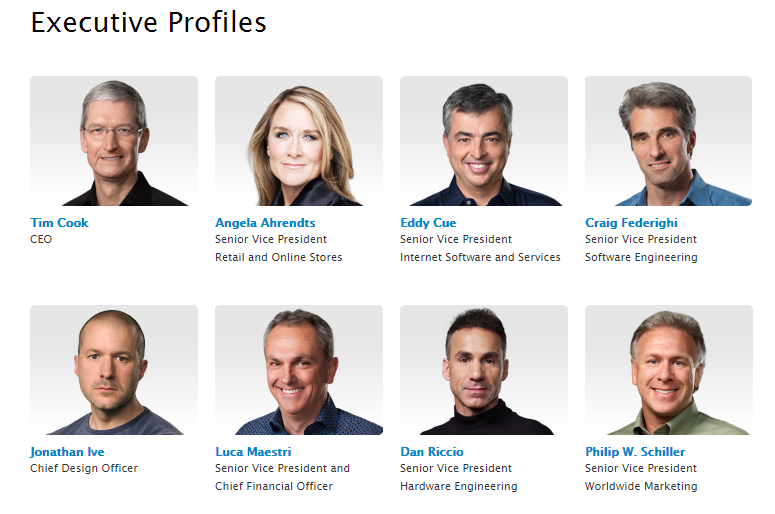 Apple’s products are intended to be inventive, unique and revolutionary, so their leadership portraits are designed to take a backseat to the company’s offerings. They match the brand’s distinct design aesthetics – modern, stylish and sleek – but they aren’t overly complex or flashy. Apple may make some high-tech, complex and even colorful products, but since they are fundamentally a company designed to make your life simpler, and their portraits reflect that simplicity. There’s no need for animation, jokes or start-up-culture lightheartedness. Apple is a great reminder that if your brand doesn’t necessarily lend itself to humor, don’t try to be funny, and don’t try to be cute. Your audience will see through it. Similarly, if your brand is light-hearted, don’t be too square. Speaking of being square, Square is an example of an innovative, hip, relaxed brand that misses some opportunities on its “Meet Our Team” page. Stuffed in the careers page, rather than an “About Us” section (which hides it from view, and miscommunicates its purpose) you’ll see a fairly well-designed visual list of departments at the company. While the page looks nice, it doesn’t function at all like an employee head shot page. Instead it shows candid and portrait photos of one or two employees within each career category. It is unclear whether these people are executives or employees, if they are a small assortment of the team or the entire group, or even what their roles are. Square’s page is modern and elegant, but it simply doesn’t function as a directory. Instead, it communicates the information that a user might want in a careers video: a sampling of its employees in their day-to-day office life, quotes that hint at who they are and photos broken down by department. They’ve since replaced this creative page with a far less personal design that includes a static photo of an office and no employee photos at all. For a company now owned by Priceline, who has used William Shatner as its pitchman for almost two decades, you might expect something more fun. 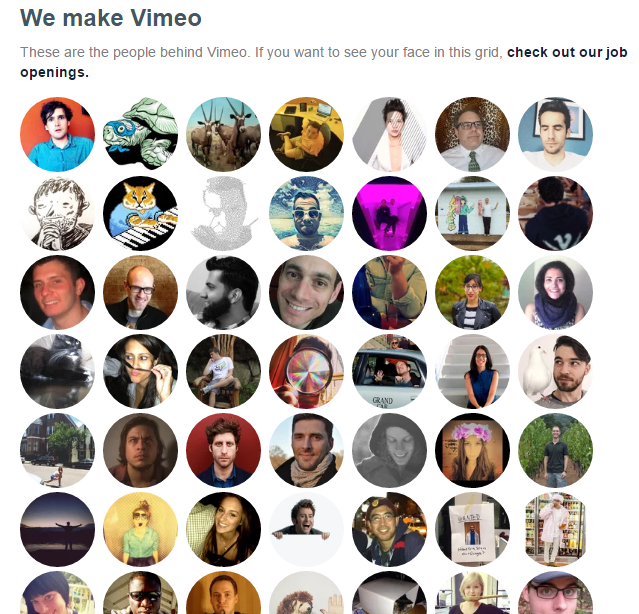 Vimeo’s unsuccessful staff photo section might be the most surprising of all. For a company that arose to compete with YouTube by offering directors and creators a supportive, creative place to display their art in a high-quality format, Vimeo’s employee photo section could be a lot better. Although it echoes the Kickstarter approach. Vimeo’s layout overwhelms the eye, especially with other elements crowding the same page. Not only does the page seem unrelated to Vimeo’s product and branding, but the photos are low-quality and the site copy is uninspiring. It’s a missed opportunity for the brand to show off its creative employees. While the portraits are likely designed to show their employees’ personalities, the disjointed backgrounds and styles are overwhelming, somewhat unprofessional and noncommunicative. If you’re tasked to design your company’s employee photo page and you think you need to go all-out and make the most creative, interactive multimedia page possible – think again. The most important thing to remember is that boring isn’t bad, but misaligned branding is. Kickstarter and Apple may have very different photo pages, but just because Apple’s is more subdued, it isn’t “boring” – it’s reflective of their brand.